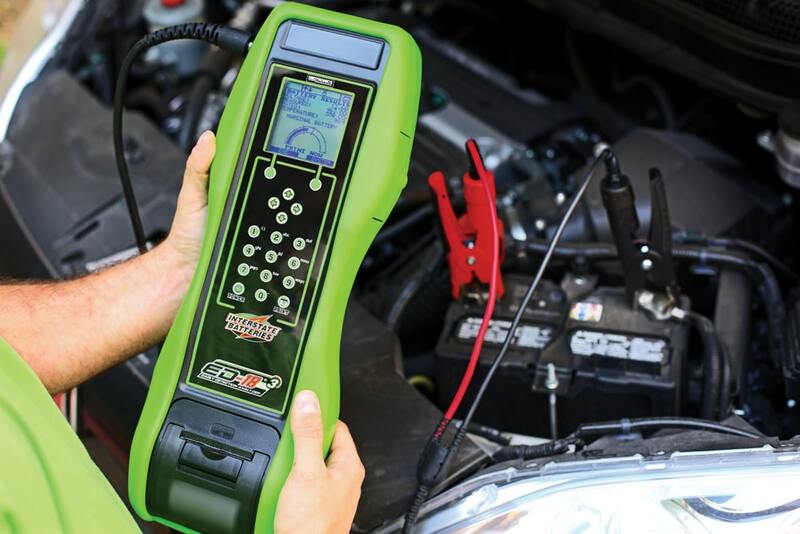 If you are looking to do more work on your car, you need to have the right tools. Car jacks and steel floors may not be the best way to go about it since they are not very effective when it comes to lifting heavy vehicles. In addition, they are not as stable as you would want them to be, meaning your vehicle will not be anchored properly in place. Therefore, finding the best vehicle ramps to raise your vehicle off the ground for maintenance works such as oil changes can make your life a lot easier. Having a reliable and functional ramp can make a big difference. With these items varying greatly in price and differing considerably in terms of material quality, selecting the right ramp is not simple. The goal of this article, therefore, is to make the selection process easier for you. We give you a guide to selecting a vehicle ramp and we review some of the best vehicle ramps. While all the different sets of vehicle ramps available in the market today may seem similar, they are all quite different. Every time you go beneath your car, you are entrusting your life to the vehicle ramp. If for unfortunate reasons the ramp malfunctions, the car may end up crashing you. That is why it is important to take your time and look for the following things when choosing a vehicle ramp. The size of ramps you need to get will depend on how low your car sits. 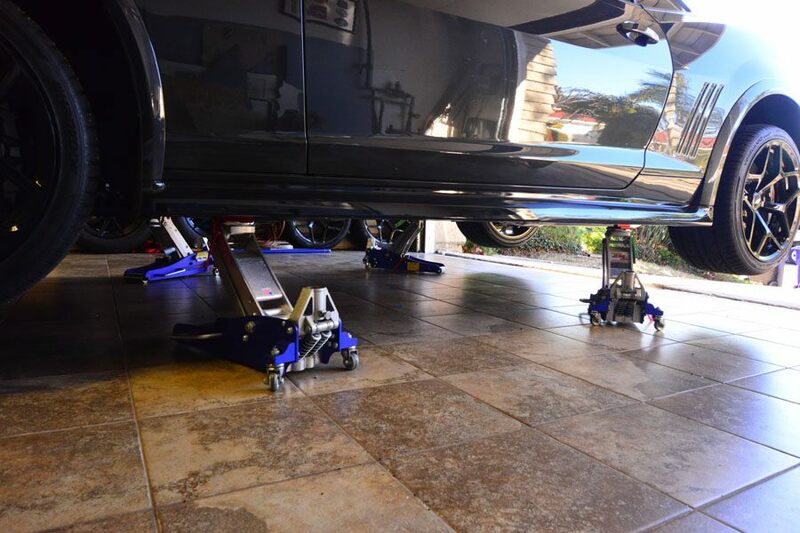 You will need to know whether or not your vehicle might be too low to the ground to work with standard ramp sizes. Lowered vehicles may have difficulty mounting standard-sized vehicle ramps. If you drive a car that sits inches from the ground such as a sports car, you will need ramps with a great deal more height. To ensure you end up with a ramp that will accommodate your car without damaging it, you should search for low profile or low clearance ramps. For high-sitting trucks, short and stubby ramps can work for you. The surface of your preferred ramps should offer enough traction for your car to drive up in any circumstance. Smooth surfaces on-ramps will encourage slippage, even if the ramps have a low incline. 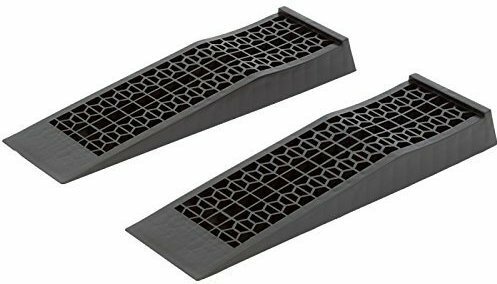 Rubber and plastic ramp provide enough traction through texture alone whereas metal ramps will need grooves to keep the car locked in place. There are generally three materials used to make car ramps. They include metal, plastic, and rubber. Vehicle ramps made out of metal are stronger and last longer. On the other hand, rubber ramps can withstand a lot of abuse and do a great job of holding weight. Plastic ramps border on being ridiculously strong and being very flimsy. The weight capacity of any car ramp refers to the maximum weight the ramp can safely support. This is one of the most important things to consider when buying when looking for the right ramp for your vehicle. Vehicle ramps can hold up weights of all different kinds. Despite manufacturers specifying the maximum weight a ramp can hold, the choice of a ramp may not be easy. This is mainly because some ramps only show the single axis rating instead of the Gross Vehicle Weight (GVW). Therefore, it is important to know the weight of each of the axis on your car before selecting the right ramp. Because of the positioning of the engine in the front of the car, the front axis is mostly heavier than the rear axis. You must never exceed the weight capacity on your preferred vehicle ramp despite the rating given. Exceeding the weight capacity of your ramp will not only damage the ramp but also pose a grave danger to the individual working beneath the car. Why we like it: These durable and sturdy ramps give you convenient access to your vehicle’s underside. Its internal support system features a patented polymer that provides a wide stance for a balanced distribution of your car’s weight. It features CoreTRAC, a non-skid base that reduces the chances of slippages. Being compact and incredibly robust, you can use this ramp with SUVs, pickups, and cars. 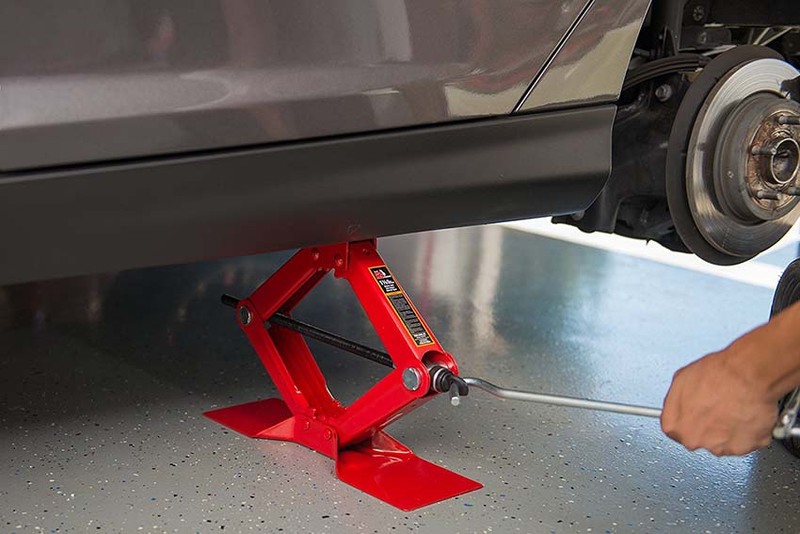 The RhinoGear RhinoRamps is made from plastic polymer and has a 17-degree ramp angle that will lift your car 6.5” off the ground. Therefore, it is easy to use for low clearance vehicles. To help prevent slippage when you first drive onto it, it has a rubber pad under the front of the ramp. Its width ensures that it can handle tires with a tread contact patch of 9” wide. In addition, this width enhances weight distribution and the weight capacity of the ramps. 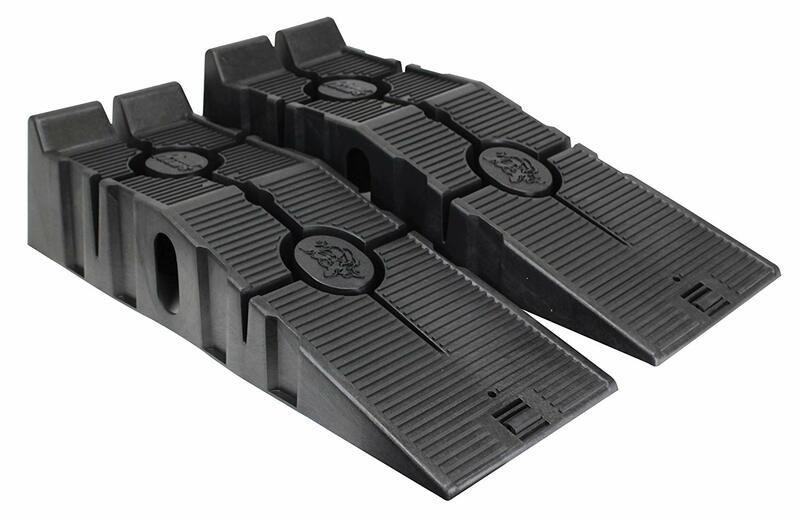 These ramps have been made using a proprietary heavy-duty resin material developed and patented by RhinoGear. The material used is tough and will serve you for a long period of time. The material is also sturdy and will support a Gross Vehicle Weight (GVW) of up to 12,000 pounds. This is one of the best vehicle ramps that you can choose to purchase today. What’s more, it is currently one of the lowest costing ramps in the market. Because of its affordability, more and more people are choosing this brand. In addition to being cost-effective, it performs well even if it only costs less than other brands. It has additional features such as its storage that makes it a very convenient tool to use. They have been made using lightweight material that also makes them portable. It only weighs 19 pounds which is light in comparison to other vehicle ramps. The RhinoGear RhinoRamps also features a space-saving design for efficient and easy storage. Being lightweight means that it is easy to carry around especially if you regularly move around. RhinoGear RhinoRamps have CoreTrac non-skid feet that help in minimizing chances of sliding during use. In addition to this patented design, these ramps have a tread pattern that makes them the most secure and efficient ramps available in the market. 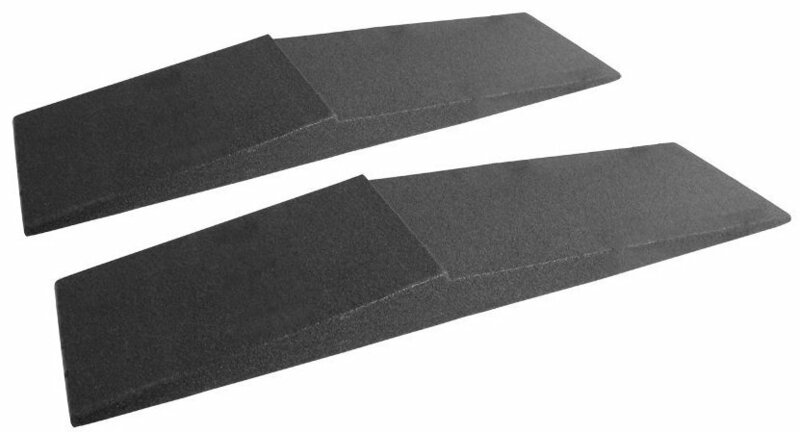 These ramps have a 17-degree inclination angle that makes them a great tool for low profile vehicles. This is mainly because that angle of incline provides an efficient and adequate clearance for such vehicles without the risk of damaging their undercarriage. They are not as wide as they should be as reviewed by most users. Therefore, you cannot use them if the width of your tires is more than 9 inches. Unlike many other vehicle lifting devices, you cannot adjust this ramp’s height when a car is resting on it. Why we like it: This ramp can be easily used and maneuvered. Featuring a special construction, this ramp ensures that there is no mark or scratch left while being used. The RR-40 race ramp is a darling with sports car lovers requiring a sleek and simple car ramp design. A highly durable car ramp, it has anti-slip features which are very useful on smooth surfaces. The Race Ramps RR-40 weighs only 8.49 pounds making it lightweight. The advantage of lightweight ramps is that you can easily carry and maneuver with them. This is a great advantage for drivers owning sports cars. They can rest easy when they come in for a pit stop on track day, knowing quite well they’ve carried along with them a vehicle ramp. It comes with a carrying strap for easy storage and transportation. In addition, it has sufficient capacity to hold light vehicles such as sports cars. Each ramp has a weight capacity of 1500 pounds and both can hold up to 6000 pounds. These ramps are made of solid core design and constructed of high density expanded polystyrene foam (EPS). They are also sprayed with a hybrid polyuria coating that improves the strength and makes the ramps impervious to all automotive chemicals. The coating also makes the ramps extremely resistant to slippage. They can be used on icy surfaces without slipping. 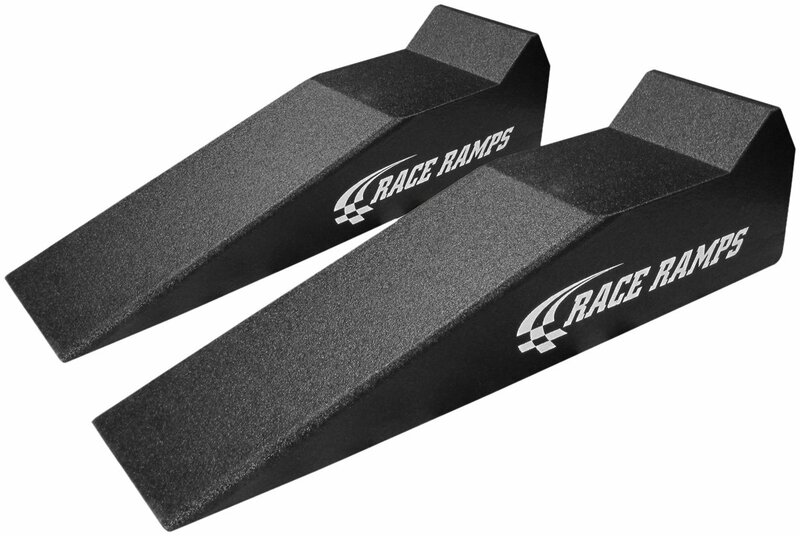 Race Ramps RR-40 are extremely stable and impervious to collapse. Therefore, they can be used on any flat surface including grass, sand, and dirt. Their wide solid base ensures that they can accommodate tires as wide as 10 inches. The ramps also have a reduced angle of approach at 16.7 degrees, which makes them ideal for sports cars such as BMWs, Jaguars, and stock Miatas. The foam design is not a favorite of many according to reviews. Why we like it: This ramp gives you the additional clearance you require, whether it is for routine maintenance, repair, or just an oil change. Being made out of steel, these ramps are reliable and will offer any customer the satisfaction they require. It is capable of handling vehicles with a maximum weight of 6,500 pounds, with every single ramp capable of taking 2,000 pounds. While most of the ramps available today are made out of plastic or resin, these Nicky Nice ramps are made out of solid steel. This definitely makes them tougher and more durable. To prevent corrosion as well as wear and tear, the surface of these ramps have been powder coated. To improve traction, the Nicky Nice steel ramp features extruded holes on the surface. 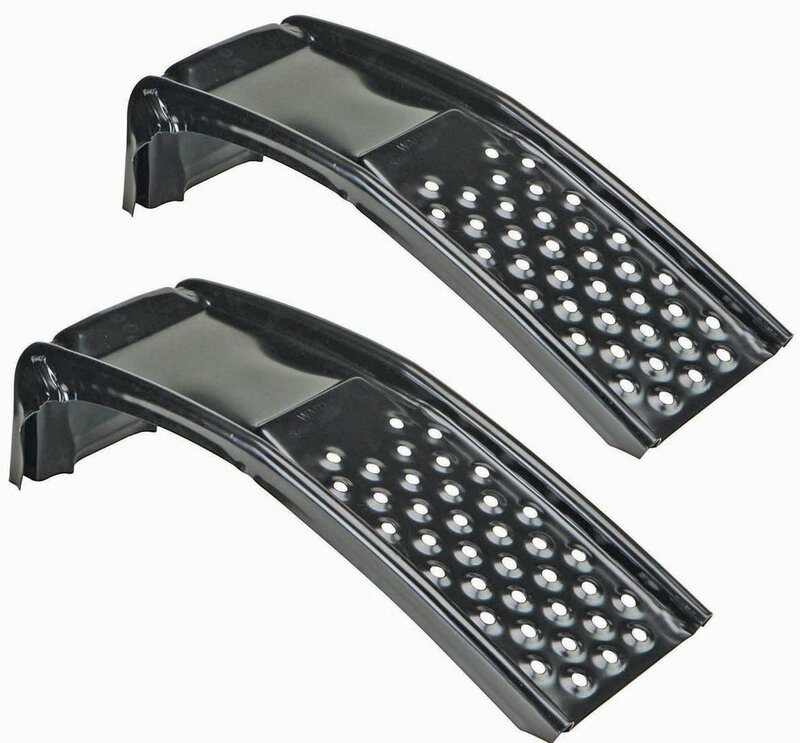 These help the tires to grab and avoid ramp slippage. On the sides of this ramp are raised safety ribs, which are particularly helpful in providing safety when reversing onto the ramp. 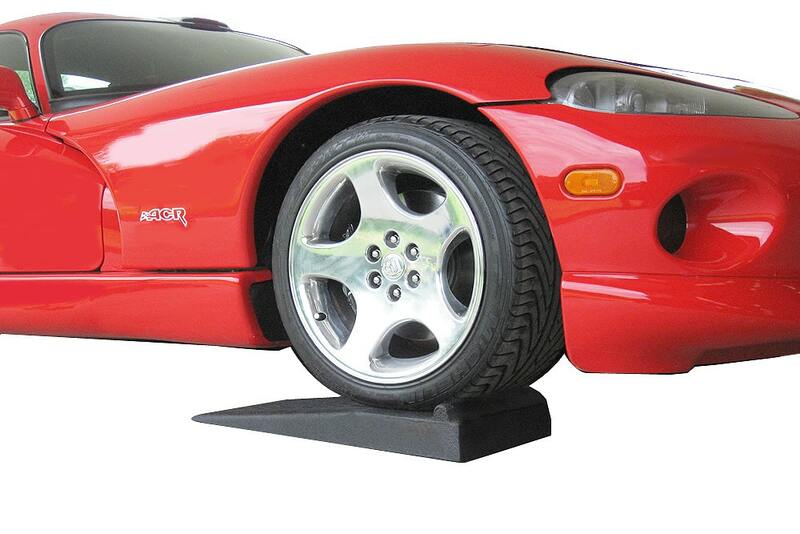 Measuring 8 inches tall, these ramps provide enough clearance for you to carry out maintenance on your vehicle. As far as width is concerned, they measure in at 9 inches. Why we like it: The Magnum 1002-01 Automotive ramp system is capable of coping with a combined weight of 16,000 pounds. It is a 4-piece ramp system that features a safety chock and manufactured with the environment firmly in mind. This product has been well made and is easy to use. In addition, you do not need to assemble them and they are very lightweight. Made from tough, eco-friendly material, this ramp is environmentally friendly. The tough material makes it capable of holding up a gross weight capacity of 16,000 pounds. It has a four-piece detachable system that you can assemble and disassemble making it easy to store. Once you’ve positioned your ramps and driven up onto them, you can flip the locking mechanism on each ramp to disengage the slopes. The sloped pieces serve as the chocks for the other vehicle’s wheels. It features a low-angle design which assists in an easy drive up the ramp. In addition, most customers have complained about the quality of the design and said it is not suitable for their vehicles. Why we like it: Rather than being designed for normal vehicles and trucks, this ramp has been designed for trailers. If you own a trailer, you are familiar with tire blowouts. The Trailer-Aid Tandem Tire changing ramp is a safe, sturdy, and easy way to quickly change a flat tire. It elevates the damaged tire using an intact one as the support point. In addition, you can use without seeking help from other people. Made out of lightweight, super strong polymer, this ramp is robust and of high-quality construction. Because of this strength, it can hold a total weight capacity of 15,000 pounds. In addition, it is resistant to rust and water. You can easily change your trailer’s tires even if you are alone since the Trailer-Aid tandem ramp is portable and easy to store away when traveling. With rear slow and front holes, it provides you with easy access and handling. It has a clearance of 4 ½ inches ensuring you have more than enough room to work on your trailer. It is quite easy to use alone since you only need to elevate one tire while the other gets support. It is durable because of its robust and high-quality construction. It is ideal for tandem trailers. Allows you to keep cargo in trailer while changing the flat tire. Not suitable for all trailers you, therefore, need to check if your trailer is compatible with this ramp. Why we like it: Made from high-impact plastic, the Black Widow Service ramp is capable of withstanding any abuse thrown at it. The strength of this sturdy design ensures that this ramp can support up to 16,000 pounds in gross vehicle weight capacity. Therefore, it is suitable for owners of large vehicles like SUVs, trucks, vans, and large sedans. With a 7-inch maximum lift height, it provides sufficient lift to high-clearance vehicles. Manufactured from high-impact plastic, the Black Widow Car Service Ramps has a durable construction. The strength of this design makes it capable of handling an 8-ton vehicle without any signs of bulking under all that pressure. At its core, the Black Widow features an internal support mechanism that allows the vehicle’s tires to distribute their weight evenly onto the ramp’s platform. This allows for more stability and more secure support. The ramp’s platform has also been designed with the grid pattern that mimics the tire tread pattern of most modern vehicles complete with 3 channels. The grid pattern serves to provide sufficient traction to any vehicle while it drives-up the ramp. This grid design also allows water, snow, and dirt to filter through. It features a steeper incline compared to other ramps. This makes it suitable for a high-clearance vehicle such as SUVs, trucks, vans, and large sedans. The steep incline should however not be a problem since the grooves are there to provide enough traction for the vehicle to easily get up the ramp. It measures 35.5″ L x 12″ W x 8.5″ H and provides a maximum lift of approximately 7-inches off the ground for performing routine maintenance, oil changes and more. The width of this ramp, which is almost a foot wide, gives extra room to maneuver your vehicle. However, this requires a lot of skill to perfectly drive-up your truck on this ramp. Weighing in at 19 pounds, the Black Widow is a heavy ramp. Therefore, you cannot carry the ramp with you. Why we like it: This is a great ramp for small and medium-sized cars. Due to its solid and high-quality construction, this ramp can safely lift up to 12,000 pounds. Its design features a parabolic arch that runs through the center of the unit. The arch enhances the strength and weight distribution of the ramp’s base. It has a rather smooth angle of inclination making it suitable for low profile cars. They can be used to increase the ground clearance by up to 6 inches. 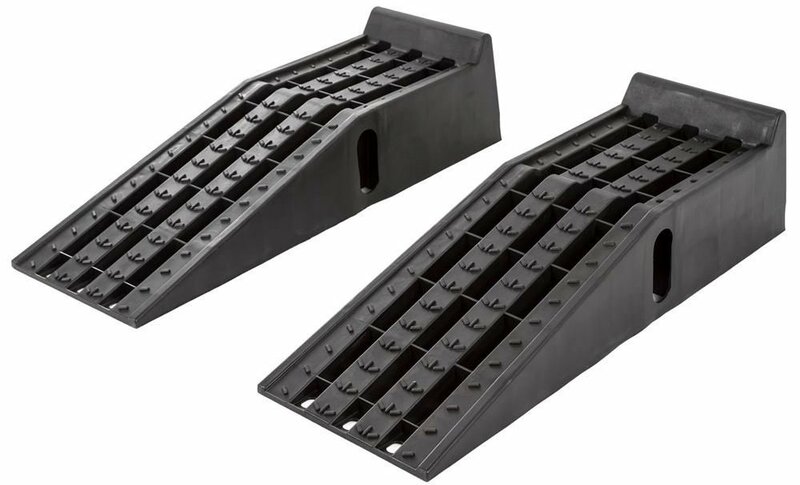 Made from resin instead of the more conventional plastic design, the Specter Plastic Automotive Ramp Set delivers quality and durability at a fantastic price that any vehicle owner can afford. The sturdy design of this ramp means that you can drive-up a car weighing up to 12,000 pounds. However, at 20 pounds these ramps are quite heavy to carry around. The ramp features a core parabolic arch in its design to distribute weight and maximize the strength of the plastic. In addition to this arch, the Specter ramp has an open grid design that allows water, snow, dirt, and a lot of other stuff to fall through. You can be sure that no particles will collect on the ramp. What’s more, this open grid design doubles up and offers great grip and security. It is lightweight, but sturdy meaning that you can carry it whenever you travel. Strong with great weight distribution due to the arch design. The grid design prevents the buildup of dirt, snow, and water while also providing enough traction for the vehicle to drive up the ramp. Relatively wide at 8 inches ensuring you feel safe while the care is on the ramps. Because of its strength, it can support weights of up to 12,000 pounds. Safe for all weather use. It doesn’t provide much clearance to vehicles such as MK7 Gtls. Why we like it: The Discount Ramps 6009-V2 provides extra ground clearance for those with low-profile cars. They will raise your low clearance vehicle to about 2.5 inches above the ground, which should be enough for you to get beneath the vehicle. It features a smooth angle of inclination suitable for low profile vehicles. The Discount Ramp 6009-V2 low-profile service ramp possesses a sturdy structural design that is capable of handling a Gross Vehicle Weight of 4,400 pounds. It is manufactured from heavy-duty plastic that is capable of handling the above weight capacity. This ramp features an incline of just 9.05 degrees, which is suitable for low clearance vehicles. It also provides a clearance of about 2.5 inches that may seem too small to perform oil changes. They can instead be used to keep the car a little bit higher off the ground during storage. In addition, these ramps can be used to get a jack under a low car by providing a little bit of extra clearance. The honeycomb design of this ramp avoids long-term buildup of moisture. Furthermore, the honeycomb design pattern ensures the safety of the vehicle while on the ramp as well as offering great strength to the ramp’s structure. It also provides sufficient traction when the vehicle is driving up the ramp. The ramp includes tire stop ends with groove wheel that acts as an extra security measure. Features a heavy-duty honeycomb design that not only ensures the safety of the vehicle on the ramp but also offers great strength to the ramp’s structure. Due to the strength of the material and design, it can support up to 4,400 pounds. Why we like it: Available at very reasonable prices, the Tomoika Racing Super Slopes vehicle ramps are designed to help individuals with lowered vehicles reach all jack point areas. It is made of a strong plastic material that only weighs in at 10 pounds making it light to carry and easy to store. The most attractive and tempting feature of this vehicle ramp is its lightweight construction. 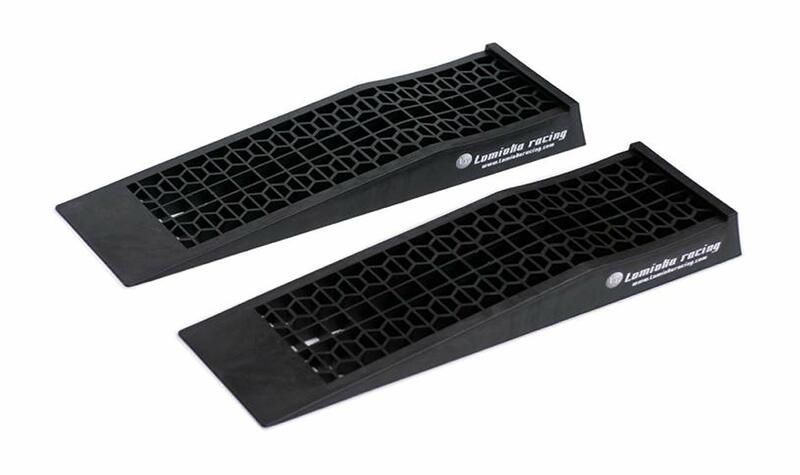 While the dimensions of this ramp pale in comparison to other ramp systems, the Tomoika Racing Super Slopes provide a clearance of approximately 2.5 inches off the ground. It features a gentle incline of slope that is unlike other systems that come with a steep grade. The gentle incline ensures that you get a gentle ride towards the top until your wheels rest on the intended platform. In addition, the ramp’s gentle slope is suitable for low profile vehicles to ensure their undercarriage is not damaged. The Tomoika is made from a strong plastic material that gives it remarkable lightweight characteristics. In addition, each ramp weighs only 5 pounds. The fact that it is light makes it easy to bring it along and store it. Despite being lightweight, the plastic construction of this ramp makes it feel beefier than other systems. This vehicle ramp is one of the lowest costing ramp in the market currently. Because of the low price, it costs more and more people are choosing to buy this brand of vehicle ramps. Highly durable because of the strong plastic material used to manufacture it. It is very lightweight, weighing only 10 pounds. It does not cost much making it affordable to many drivers. The gentle incline makes it suitable for low-profile vehicles. Provides sufficient traction with the superior grip track system. Why we like it: Unlike most car ramps that have very steep inclines or angle of approach, the Race Ramps Xtender is an ideal ramp for very low profile or low clearance vehicles. This is because of the gentle incline that gives your car a smoother ride up to the highest platform. Therefore, you do not have to worry about scraping the underside of your of your race car. The solid core of this ramp makes it more secure and stable for your vehicle to climb onto. This is unlike the dubious designs of other car ramps that are made of materials that pose a danger to your vehicle due to instability. However, this ramp cannot be used on just any ordinary ramp; the ramp has to be the 56- or the 67- inch ramps from Race Ramps. Therefore, it is more of an accessory to Race Ramp products instead of an actual vehicle ramp. Race Ramps RR-EX Xtender have a 6.6-degree inclination that makes them a great tool for low profile vehicles since the clearance is sufficient and adequate. The gentle incline gives your car a smoother ride up to the highest platform. This ramp has a non-slip, unscootable surface that will not slip or slide, no matter the surface. This ensures that you have sufficient grip to keep your vehicle stable while you are on the ramp. Weighing just 10 pounds per ramp and with a solid core, this ramp is light in weight. Therefore, you can easily carry it with you when you travel. It has a solid core, which means that there are no holes or hollows where spiders may hide in. Sturdy design makes it more secure and more stable for your vehicle to drive up to. With a non-slip and unscootable surface, it ensures that the ramp stays in place even on slippery surfaces. The gentle incline makes it excellent for low clearance cars. It is lightweight in design making it portable. You can carry it along while you travel. The above 10 ramps are the best vehicle ramps available on the market now. This can help you narrow down your options so that choosing the best product becomes easier. You can choose any of these models and use them the next time you are draining your car radiator or changing the oil. Before you make up your mind on which vehicle ramp to purchase, have a look at some of the important considerations you need to make. To prevent ramps from shifting, moving, or otherwise launching out from beneath the vehicle’s wheels’ some ramps have been fitted with anti-slip surfaces. These surfaces help keep the vehicle ramps in place as a vehicle is being driven off. If your garage has a smooth concrete floor, it is necessary that your vehicle ramp has anti-slip features. You should be less concerned if your garage floor provides you with higher-traction, typically a gravel floor. It is vital to ensure that your garage roof has proper clearance above just like you would want to know the clearance requirements beneath your vehicle. Individuals with high-sitting trucks might be in for a rude shock when they use their vehicle ramp and have a garage with a low roof. To avoid an untimely impact, it is important to check the distance between the vehicle’s roof, and the garage’s roof against the lift height of the ramps. It is important to consider how high the underside of your vehicle is above the ground. This will help you avoid damaging your vehicle by buying a ramp that will not fit beneath your car. Therefore, you are advised to buy a ramp in accordance with the ground clearance of your car. Low clearance cars will need low profile ramps. Low profile ramps feature gentle inclines and are longer to allow the car to gradually drive onto them without causing any damage to the undercarriage. On the other hand, vehicles with sufficient clearance have ramps that are shorter and with steeper inclines. You need to consider the width of the ramp in relation to the tire width when selecting the right vehicle ramp. Doing this will ensure that you know how much room for error you have while driving your car up the ramps. You need to measure the width on your vehicle’s tires to determine the right width of the ramp. The right ramp for you should be wide enough to accommodate the tires and leave enough space on either side of the tires. For example, if you have standard P215 tires having a width of 8.46” you need to get a ramp with a width of about 12”. Choosing the right width of a ramp will help reduce slippage when loading the car on the ramp. Park your vehicle on a non-slip surface and ensure the wheels are facing forward. Place both ramps with their lower slopes centered perfectly with the tires. Carefully drive forwards and up onto the ramp while ensuring that the front wheels are at the center and flat area of the ramp. Repeat the above if you find they are not properly aligned. Once the car is sitting on the center of the ramp, you can use the parking brake to keep the vehicle from rolling back. Rock your vehicle to ensure it is secure. Place two wheel chocks to ensure that the car doesn’t roll off in any direction. Car ramps are essential tools that one should have with them in their vehicle. The best vehicle ramps for any car will depend on several factors, such as the inclination angle, weight capacity, level of traction offered, quality, and the width of the ramp. Despite having these considerations in place, the preference for vehicle ramps will vary among car owners. Despite your preferences, remember that not all vehicle ramps are made equal and just as cars are all individual based on their model, make, and weight, so too are ramps. The considerations and reviews discussed in this guide are sufficient to help you choose the best vehicle ramp for your car.